If we've catered for your family event or even if you've tasted some of our food and want to share your thoughts with others, we'd be delighted to hear from you. Just post your comments using the form on this page and they'll be published on our website after review and approval. One of the loveliest things about our catering business is receiving thank you letters after we've catered for a party or celebration. We'd love to share some of these thanks with you so you can see why people across Bedfordshire, Hertfordshire and Buckinghamshire come back to us for catering year after year. Just to send our thanks for the fabulous buffet lunch you prepared for Thelma's funeral gathering yesterday. We had several lovely comments from family & friends on the presentation & variety of platters - pork pies & gluten free brownies seemed to be particular favourites! We were so thankful for your professional & caring help with arrangements, you certainly helped to relieve some of our stress and worry in organising everything for the day. With warmest wishes for a restful Christmas. I just want to thank you for your excellent response to my enquiry. I found you a very professional caterer, willing to give me advice when I was a little lost for idea`s or quantities. You were punctual on your delivery & set about making it all look fantastic. Many of my guests remarked on the very high standard of food & the excellent taste of the cakes. It was good to meet on Saturday at Mum's birthday party. Many, many thanks for providing us with such a lovely array of food and all set out so attractively. Thanks too, for the efficiency with which it was all installed - both food and tables - and cleared away afterwards. It certainly gave us sisters some breathing space and re-assurance so that we were free to enjoy the more social aspects of the afternoon. Particular 'likes' were the egg and bacon and prawn and seafood sauce sandwiches. The platters were also given the thumbs-up and most of the cake disappeared despite some of our numbers not able to attend at the last minute. Sorry I have not written sooner but I have been extremely busy tidying up the house following the wedding !!! I would just like to thank you for the fantastic Afternoon Tea you supplied for my sons wedding last Friday. It was well above my expectations and my guests were most impressed. Everyone thoroughly enjoyed the amazing selection of sandwiches and cakes. The service was second to none and saved me from so much stress. I am extremely grateful for that !! Everything was perfect right from the moment I placed the order, from the communication to the courteous and prompt delivery right down to the delicious catering itself. I will definitely be recommending you to my friends and relatives and should I need any catering in the (not too soon !) future, I will not hesitate to give you a call. Firstly a huge and heartfelt thank you to you and the team for your amazing service. 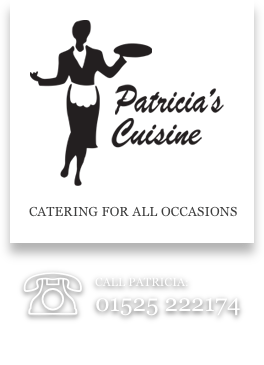 I was absolutely delighted with the food and the service that you provided at my 50th birthday celebrations. Everybody has commented on the amazing hog roast and the salads that you prepared. They were really excellent - thank you! Over and above that wonderful food was the service that your team gave - they are such lovely ladies - and they made the day and evening really special for me also. There was NOTHING you didn't think of, even organising the generous gifts that everyone gave me. Thanks again for that! Of course I was so lucky with the weather, and of course this will be a day and night to remember. Since that weekend I don't think we have had more than an hour of good weather and I cannot stop feeling extremely lucky that everything, absolutely everything went like clockwork. I even managed to wear off any hangover by having a couple of extra hours sleep in the morning - only to come down and find one of my Spanish house guests had totally blitzed the kitchen after the night before, when everyone had piled in and the party had gone on for several hours longer indoors. Also I'd like to say a big thank you to you because I know that before you left you actually also blitzed the kitchen and left it immaculate. I know that you know how much I was looking forward to letting my hair down and really having an amazing party - and that is exactly what it was - truly memorable for me and also for most of my guests. I am sure that you are enjoying getting to know your new grand-daughter - what a special time this must be. Enjoy every moment. My husband and I would like to thank you for the wonderful day which you made for us. Your buffet lunch which you provided was excellent. All our guests from near and far commented on how the room was set out and that the food was superb. Your team of girls worked hard and Wendy was top rate. Just a brief note to thank you for the retirements buffet with the added 'Easter Bits' (which the girls loved and immediately whisked away). All the food went and everyone thoroughly enjoyed it. A simple 'thank you' to acknowledge what a great contribution you and your colleagues made to our little party. Everything worked like clockwork as the crowd buzzed around you.